There is bread, and there is love. Sometimes there is both. In the upcoming film, Julie and Julia, Stanley Tucci, portraying Paul Child, the adoring husband of Julia, played by Meryl Streep, toasts her, saying: "You are the butter to my bread, the breath to my life." That quote encapsulates the overall tone of the film -- sweet, sincere, and deliciously uplifting. 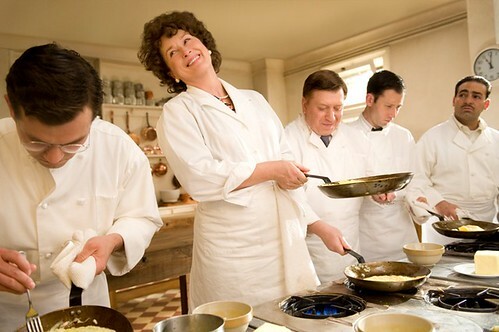 The film is based on two bestselling memoirs: Julia Child's My Life in France, which was published posthumously, and Julie Powell's Julie & Julia: 365 Days, 524 Recipes, 1 Tiny Apartment Kitchen. The film is actually like two films: One tells the story of Julia Child's loving marriage to Paul and her rise to culinary fame in post-WWII France. The other tells the story of Julie Powell, who on the eve of her 30th birthday, gives herself a masochistic gift: Cook all 524 recipes in Julia Child's Mastering the Art of French Cooking. In one year. In her tiny Queens, NY apartment. With a cat. And an unbelievably supportive husband. And blog about it. Meryl Streep is extraordinary as Julia Child. She captures Julia's effervescence perfectly, not to mention her delightful way of saying, "do" as "dooooooo," yet never comes close to caricature. She's so charming that I found myself missing her when she wasn't on the screen. Amy Adams and Chris Messina, who play Julie and Eric Powell, are well suited as actors. Though Adams has the meatier role, Messina does a fine job of making Eric's role interesting. In fact, at an LA movie-promoting event last week, Powell told Messina that his portrayal of her husband was so spot on, it "was freaky." Whether you're a dedicated foodie, a blogger, a Meryl Streep fan, or just a sucker for a good romantic comedy, you'll find much to like about this film. For those of you expecting an exact retelling of Powell's book, which was seasoned with wicked humor and stirred with expletives, just realize that the screenplay is loosely based on the book. As Julie Powell shared with her audience in LA last week, "It's a romantic comedy. It's a sweetened version of reality." Exactly. And like any good romantic comedy, everything works out deliciously at the end. Sort of like a light, sweet, beautifully whipped French meringue. Julie and Julia opens August 7, 2009. Stay tuned though -- I'll be offering 20 complimentary tickets to an early August 6th screening of the film in LA! I have been SO looking forward to this movie! Can't wait until it hits our theaters here! I couldn't get into the book, which I was actually so excited to find at my used book store. Julie's flippant way of dealing with the families of 9/11/01 really bothered me and I actually stopped reading it. I was in my freshman year in NY during 2001/2002, and I had many friends who were full of grief because they lost people who worked in the WTC or who were part of the rescue efforts. Later on I worked with the NY State Museum on an exhibit with recovered objects (including a crushed firetruck), and the amount of feeling that so many people attribute to the event floored me. To pick up this book and see the utter loathing that Julie had for people whose family members are still not fully recovered to this day (NYC Forensics is still finding skeletal remains) made me cringe and not care to read any more. Does this attitude continue in Julie's character in the movie? Because I so want to see Meryl Streep as Julia Child. Thanks for sharing, Susan. Will give this a think, as I'd seen the concerns raised by gexxinknoxville repeated in Amazon reviews of the book (in addition to more concerns) quite often. I just love Meryl Streep. Haven't watched this one, though. Nice review. Hi Susan - how are you? Film looks great, looking forward t it opening up over here. I am already planning a theme date night involving cooking one of Julia Child's famous recipes and going to see the movie! I can't wait! What a nice summary - I can't wait. I read the Julia memoir and really loved it. This is on my must see list for August. Thanks for the review! I am waiting ever-so-patiently for it to hit the theaters! My husband and I laugh out loud when we watch the movie trailers! I have been waiting for thre movie with baited breath Susan:D like all food bloggers. I have not read Julie and Julia but I have read "My life in France" 2x and will read it again as it was so well written and engaging. I am so excited with the preview as I see the pages from the book come to life. Meryl Streep is perfect in her role as Julia Child! Thanks for the review! I enjoyed the book and was stoked when I saw they were making a movie of it! Fun! I absolutely loved the book. It did inspire me to start my own food blog. I can not wait to see the movie!!! How interesting, I was just talking about this movie at lunch time...thank you for sharing the info. I've been waiting for months for this movie to come out... I can't believe it's almost time! joey-I know! It's going to be a big hit w/food bloggers! gexxinknoxville-I can appreciate your feelings. No, I don't think that comes across in the film. Julie's character is softer and tamer in the film. mark-I understand. There are many differing opinions about this book, but I think it's important to read it for yourself and make a determination. david-I'm well. Hope you are to, my friend. It opens here on Aug 7.
katrina-Now that's a delicious idea! tw-I loved the memoir too. patsyk-That's so great to hear. Then I'm sure you'll love it in its entirety. veron-I enjoyed that book as well. Julie's is quite different, to say the least, but wickedly funny. manasi-I agree. Meryl Streep is phenomenal is every role she plays. PS- Thank you! julie-I felt the same way as you. danielle-I think Julie was an inspiration for many food bloggers. annie-Oh, I'm glad you enjoyed it. Thanks. michelle-Summer has a way of always flying by. I really love Amy Adams! she made this movie to a tasty one! :) hope to see her in Leap-Year!